When buying an acoustic guitar, there are at least three things you have to ask yourself. The first would be why. Why are you buying it? There are two possibilities, each of which branches out into further nuances. One, you’re a beginner and want to impress people by playing Nothing Else Matters at parties. Well, people who are impressed by that and that alone won’t notice that you’re playing a cardboard guitar, so you won’t have to spend all that much. If, however, you are serious about playing (e. g. live performances, fun, recording, music school), this guide will help you decide. Two, you are a seasoned player, and want to buy a quality guitar. Don’t worry; this article’s got you covered, too. The second thing you have to ask yourself is what type of player you are. For beginners, this may not be obvious. Try and remember the times you practiced with your friend’s guitar. How did you pick the strings? Alternatively, think about your favorite guitarists. What’s their style of playing? This will influence the choice of tonewoods and the type of body you need, not to mention the strings. Finally, you mustn’t forget about the budget. There is one very important thing to keep in mind here – whether you are buying your first or seventeenth guitar, there is no reason to go cheap. Naturally, you have to find value for money, but keep it in range between $200 and $600. Don’t worry if you don’t have the money right away. Take some time to save the money you need. A guitar is an investment, and it’s well worth the wait. There are numerous factors that will influence the price of the guitar, which will be discussed later. Of course, there are also ways to knock off a penny or two. Just in case you are not clear with the terminology, here’s a diagram you’ll be able to check every time you don’t know what I’m talking about further on. What do you call a canary with a machine gun? Whatever it wants you to! So, what sound does a guitar make? Generally, the first type will yield a medium sound projection with a lot of clarity and balance between high, mid and low frequencies. This body type is popular with fingerpickers as for the clarity between the frequencies they bring into the deal. On the other hand, the parlor guitar is also popular with your average strummer. Most people will use light gauge strings because the neck on this body type is not designed to handle the stress of a medium gauge. However, this can be fixed by adjusting the truss rod (a metal rod running through the neck) to compensate for the string. The second type is what people have come to most often connect with guitars. The dreadnought is bigger than parlor and delivers more bass-y sound, more powerful than parlor. They are quite popular with heavy strummers, people playing bluegrass and country-western. The neck is sturdy enough to support medium gauge strings. Dreadnoughts will make anything from fifty to ninety per cent of the guitars you see in a music store. The last type is the jumbo. This body style gives you the same depth and “boominess” of a dreadnought in a classical guitar shape. It’s curvy, like classic, but big and deep like dreadnought. They’re popular with strummers who have the need for that punchy and loud sound with heavy lows. Like dreadnought, it’s best used with medium gauge strings. Any of the body styles mentioned can feature a cutaway (yes, it’s exactly what it says on the tin), which implies there’s a piece of the body missing to allow the player better access to high-end frets. 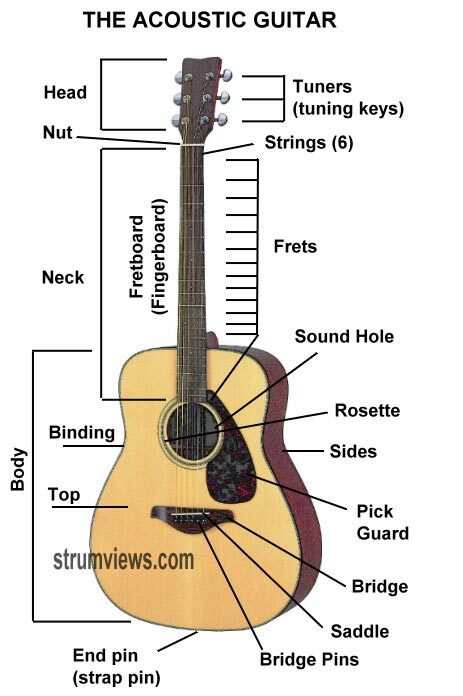 Some argue that these does not affect the sound and resonance of the guitar, while others claim cutaways have a brighter sound, while non-cutaways hold a richer sound. The issue is a skub. True or not, you can work this to your advantage, depending on the type of player you are. In addition to the body type, the material can also affect the way your guitar sounds. Not only that, it will also affect the price, depending on the type of wood use for the top (sides, back and neck woods also play a part, but the top is the most important here). There are two types of build, contingent on the way it’s made – laminated veneer and solid-wood. The first uses two or more thin sheets of wood that are glued together. This type yields a lower quality sound than the solid tops. Solids will have better resonance, volume and clarity of sound than a laminated top, and the price-tag will change upwards. Spruce; the spruce is very stiff and lightweight, and delivers a very clear and full-bodied tone; it’s particularly suited to players who favor heavy strumming. Cedar; cedar is very much like spruce; it really comes into its own in classical guitars. Maple – maple is a dense, hard and heavy wood; as such, it’s mostly used in multi-wood bodies; it gives an extremely bright sound. Mahogany – mahogany is medium-dense and slightly lighter than maple; it delivers a soft and warm tone on its own. Rosewood – rosewood is not all too common in tops; rather, it features in necks and fretboards; a rosewood guitar will be quite heavy, very bright sounding, and expensive. Koa – koa is mostly used for ukuleles; a guitar with a koa top will have well-defined trebles and mids, but it’ll sound a bit thin. 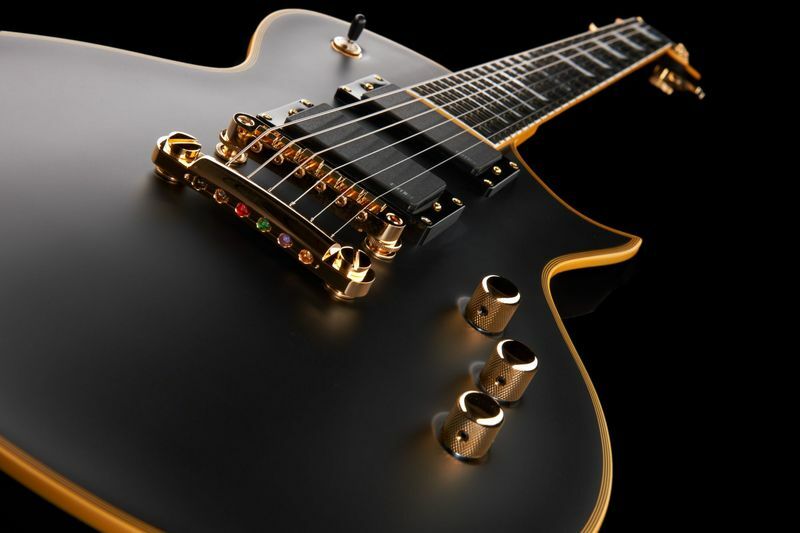 Ebony – ebony is mostly used in fretboards, although ebony tops and bodies are not unheard of; it contributes to the sound with enhanced tightness, clarity and definition. Walnut – walnut is fairly heavy and dense, sonically similar to mahogany; it’s mostly used in backs and sides; walnut guitars will often have natural glossy finish to stress the grain patterns. Here’s some actual advice on how to go about buying the guitar. First thing you need to do is check it for faults. It would be a good idea to ask the luthier for a well-lit area, or to bring a flashlight and go over the instrument carefully. Give a quick glance inside the body. A shoddy inside usually indicates shoddy craftsmanship. Check for sawdust, glue residue, faulty bracing, anything that seems off. Next you’ll want to check for any potential cracks, dents and bridge separation. While the dents and scuff marks are easily visible, cracks can be more difficult to detect, and this is where the flashlight comes in handy. Bear in mind that some scuffs and dents won’t mar the quality of the sound, so if you don’t mind having a guitar with “character”, you can show these to the seller and potentially get a discount. On the other hand, cracks are dangerous and will severely compromise the sound and longevity of the instrument. Finally, make sure that the bridge sits flush with the top. For this purpose, you can use a thin piece of paper and try to insert it in between. Next, it would be a good idea to check the neck and fretboard (fingerboard). Close one eye and look down the neck, making sure it’s straight. Crooked, bent or otherwise warped neck on a guitar is no good. Moreover, you should measure the neck size to determine if it suits you. The measure is taken at the nut, with the standard width for an acoustic running somewhere around 1-11/16 inch, 1-3/4 inch, and 1-7/8 inch. Fingerpickers and classical guitar players will typically favor a wider neck (1-3/4 inch to 2 inches). About the fretboard, make sure the frets aren’t sticking out – just run your hand along the edge and get a feel. Any luthier will sand them down to size for a decent price. Additionally, you’d be well advised to check the “action” of the board (the space between the strings and the board) – too high action makes pressing the strings too hard, whereas too low action will makes the strings catch on other frets, creating a buzzing sound. Last for this part, but not least, is checking if the guitar holds the tune and intonation well. These are connected, but different things. For the first, ask the luthier to provide you a silent place, and play a while to see how well the guitar stays in tune. For beginners, it’s a good idea to bring someone along who can help them with this. Naturally, even if you buy a guitar with cheap tuners, you can replace them at a later time. Holding the intonation is checked by paying the 12th fret (the one with two dots), then lightly touching the fret wire just towards the body of where you just played and play it again. If the notes sound the same, it’s OK, but if not, leave that guitar and keep searching. There are two ways you could go about buying an best acoustic guitar – visiting a music store or going online. If you’re visiting a store, and feel daunted by the experience, bring someone along. The more experienced a player they are, the better. Take the guitar, feel it, check it carefully, and, most importantly, listen to it. On the other hand, if you don’t have a store in your place, and decide to order your guitar online, make sure to read as many reviews as possible, as this is the only way to “hear” it before buying. You don’t have to shell out thousands of dollars for the guitars, but you should still make sure you get the best bang for buck. As noted earlier, a guitar is an investment, so take your time, save the money, and keep your price range about $200–$600. If you’re not sure you want a guitar, maybe it’s better to find someone in the family or neighborhood willing to lend you theirs. Moreover, maintenance and safekeeping is an integral part, so don’t feel shy to shell out some additional dough for a hardshell case. You know, to keep your investment safe. By now, you’ve settled on a style or combinations thereof, and saved upwards of $500. For upper limit, it’s the sky. The choice really comes down to minor preferences, and the best thing is that the guitars at the range you can afford don’t really lack for quality. The best thing to do is bring a friend along to lend you their ear. There is actually only one real problem with choosing the perfect guitar – the choice is too great. With so many types and variations, materials, nuances and customization options, the task may seem daunting. However, if you’ve asked yourself the three questions from the beginning, it should make it much easier. First, find out how much you’re willing to save, and then spend. Next, define your playing style. It’s beneficial, but not essential. Finally, ask yourself honestly – why? Are you buying it to look cool, or are you serious about playing? Mind you, the two are not mutually exclusive. When all is said and done, it really doesn’t matter that much what guitar you choose. Remember the joke? A guitar will sound only as good as the player, so it really comes down to what you do after you buy it, not before. Good luck and have a good one!